Furniture vocabulary is one of the easy areas for learners of English. However, I think that it never hurts if the students experience some success. In this post, there is a video with all the words, an infographic and three games to practise the vocabulary. Start your lesson with the vocabulary film. Listen and repeat the words and then say the English word for the furniture that you see in the picture. The words are presented and then repeated. The video is based on the learning method described and recommended by Baddeley in his book on memory. I can confirm that it works. Play the video at least twice in the lesson. Your students will remember the words better. 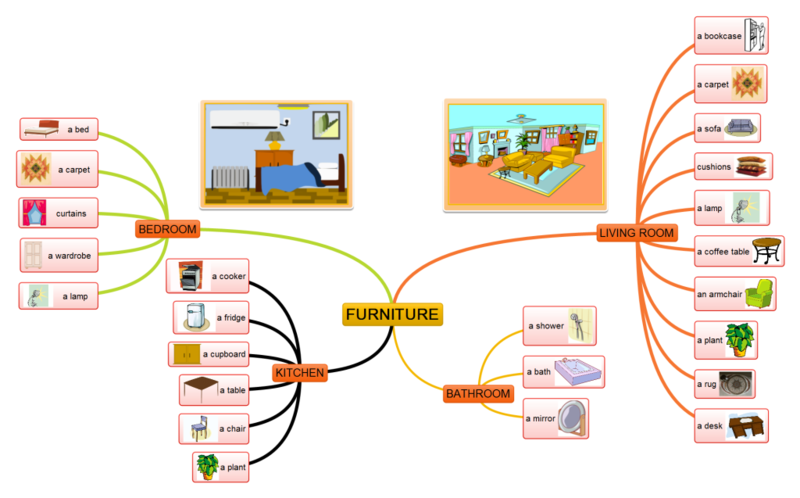 Here is a mind map showing all the important furniture words. The pieces are placed in the rooms but they could appear in a different room. And now it is time to practise the new vocabulary. Here you can find three games. First is a quiz and if you label more than 70% of the pictures correctly you will get to play a game called Indiara. The game is in HTML5 so it will play on all mobile devices and desktop computers. The second game is basketball. If you choose a correct answer you will get a chance to throw the ball into the basket. Good luck 🙂 To play this game, you need to download the game and then open it in Adobe Reader. Then click on the game and it will work. The third games is called Matching. Your task is to find the picture and the correct word. Will you manage it in fewer then 40 turns? This game is in HTML5 and it will play on all mobile devices and desktop computers. I like the way he taught vocabulary. I am very grateful if you send me more video like this. Thank you so much! Love the concept. But don’t use twitter! How about a FB link? Sorry, I try to keep my facebook for private things only. I will try to add more vocabulary videos soon. Hello, create an account just for us, cause I’d like to add you on my fb contacts and learn more English with you. See you next time.